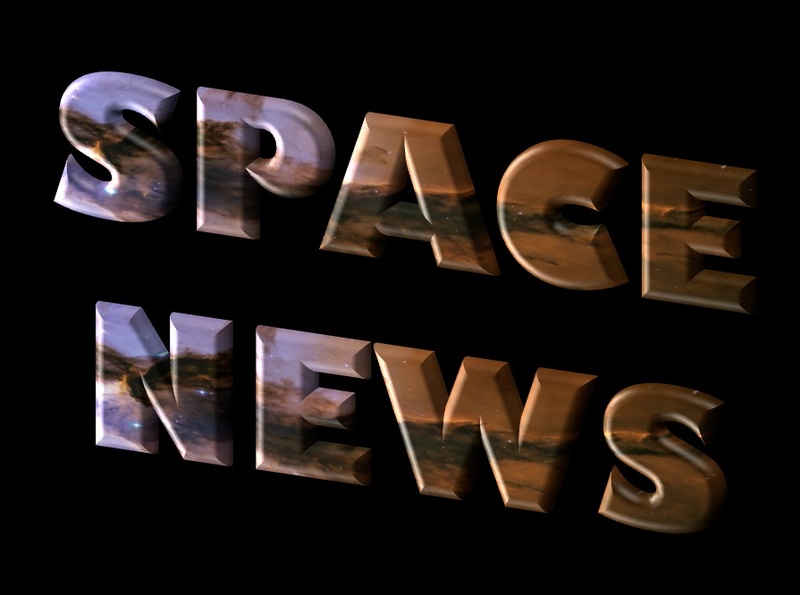 Just a spacey set of cool miscellany items this time… about… space! Here is a terrifically concise and persuasive animation about one of the bases for orbital mechanics — explaining why you must have several images of an asteroid, against the starry background, in order to determine its orbit. Modeling the universe, starting with the Big Bang, only became possible with the advent of supercomputers, fantastic software and the realization of the existence of mysterious dark matter. Combining all of these resulted in what may be one of the great scientific achievements of our time — a model that portrays the Bang, then natural evolution into the cosmos we see today, with the same array of numbers of sizes and types of galaxies. If verified, it is a stunning validation of our current models and our growing ability as simulators… then creators?… in our own right. NASA’s Kepler mission has found a planet roughly the same size as Earth, orbiting the “Goldilocks” or potentially habitable zone near an M-class (small-red) sun, about 500 light years from our system. I’ll be very interested to see if calculations show it likely to be tidal-locked. In any event, we have a good target for the next generation of planet-studying telescopes. Meanwhile, computer models indicate that having a companion planet may increase the chance of life on earth-sized planets. The European Space Agency’s elderly comet-hunting Rosetta satellite woke up from hibernation on Jan. 20. After a decade-long journey the satellite is approaching its target, comet 67P/Churyumov–Gerasimenko, and has sent back photos of the comet. Anthropologist Cameron Smith suggests that any interstellar colony starship would have to carry a minimum of 10,000 people to secure success on a genetic basis… assuming no further replenishment of breeding stock from Earth. This conflicts with University of Florida’s John Moore who, in 2002, figured only 150 people might bring enough diversity for a viable gene pool. One wonders how much this is altered if you can bring frozen sperm, ova and even embryos. Pope Francis would absolutely baptize an alien from Mars, if one showed up at the Vatican and asked for it. “If God prompts some Martians to come to Earth, find the Pope, and say “we want in on this Catholicism thing.” The pope would probably say “OK. cool.” But probably in Latin,” says The Wire. Is this really true? “Creationist Ken Ham has said that the U.S. space program is a waste of money because any alien life that scientists found would be damned to hell.” So much for the thoughtful Christian theological musings about other life and possible other redemptions, by solid minds like C.S. Lewis. Ah but then televangelist Pat Robertson shockingly has urged Young Earth Christians to can it. “We’ve got to be realistic that the dating of Bishop Ussher just doesn’t comport with anything that’s found in science,” Robertson continued, “and you can’t just totally deny the geological formations that are out there.” Dang. It’s enough to make one believe in miracles. Zircons are our probes into the very earliest days of Planet Earth. Now – in Australia – one was found with an age of 4.4 billion years. It cooled just 100 million years after the planet formed! Amazing implications. A new analysis of data from NASA’s Solar TErrestrial RElations Observatory (STEREO) shows that a July 2012 solar storm of unprecedented size would have wiped out global electronic systems if it had occurred just nine days earlier. At long last, some of the powers in our protector caste are starting to take this kind of thing seriously. But in time? Photographer David A. Kodama took this composite image capturing the unmanned, next-generation Falcon 9 rocket launch trajectory as it blasted off from the SpaceX launch pad at Vandenberg, Sept 29. Those Norwegian skydivers who “caught” a “meteorite” falling past them? All of my instincts told me… no way, man. And now it seems more likely I was right. Some possibilities often seem too cool to be plausible. Stay skeptical, my friends. The Curiosity Rover has completed two years roving over the surface of Mars. For a collection of stunning images, take a look at Mars Up Close: Inside the Curiosity Mission, by Mark Kaufman. Meanwhile, NASA is planning for its next rover — the Mars2020 mission. Here’s a Kickstarter project worth checking out. “Shrox” wants to fund production of a calendar of art depicting the settlement of Mars. Let’s talk sci and tech! So much cool stuff and so little time… so we’ll start by looking upward for this posting. First… the Wall Street Journal reports that Google is planning to spend more than $1 billion on satellites that will offer internet access worldwide from space. My contacts at ViaSat confirm that something is in the works. People familiar with the project say the devices Google intends to use will weigh less than 250 pounds. The WSJ’s sources say the costs for the venture could top $3 billion. Among many other aspects, this could be the jiu jitsu move that allows Earth citizens to evade the censorship of national governments. And many other good things! But of course, there’s always a cost. … getting out there, ourselves. How We’ll Talk to Aliens: Now available from NASA for free download (print also available) is “Archaeology, Anthropology, and Interstellar Communication” edited by Doug Vakoch, with articles about a wide range of non-astronomical aspects of contact with ExtraTerrestrial Civilizations. See more on Shouting to the Cosmos: SETI vs METI. Meanwhile, we learn about planets! Like… Godzilla earth? Here’s an interesting discovery of a rocky planet which has a mass some 17 times that of Earth. Combining transit-eclipse size measurements from the Kepler telescope with mass-tug effects from a scope in the Canary Islands, researchers showed that Kepler-10c cannot be a gaseous world but must comprise very dense material. Interestingly, the age of the host star (a red dwarf) is about 11 billion years old, which is early in the evolution of the Universe when generations of exploding stars have not had long to make the heavy elements needed to construct rocky planets. Finding Kepler-10c tells us that rocky planets could form much earlier than we thought. Gravitational wave discovery faces scrutiny: Inspiring to witness science at work, both collegial and relentlessly competitive and self-critical. In this case, the BICEP results reported in March — suggesting that polarization in the cosmic background might reveal inflation patterns in the first trillionth of a trillionth of a trillionth of the universe — might have contained some flawed image processing assumptions. We can all wait and see. But the process is fascinating to follow in this excellent NATURE article. See also this video about the simulation. I hope it’s valid. It used to be generally thought that our solar system’s largest moon contained an ocean with ice on bottom and top. But crushing pressure on Ganymede could create up to three layers of ice, with different kinds in each layer. The densest and heaviest ice on Ganymede is called “Ice VI.” Hence, Jupiter’s moon Ganymede may have a multi-layered ocean of alternating ice and liquid water that resembles a “club sandwich,” according to NASA. Elon does it again. Unveils version 2 of the Dragon Capsule… this one capable of carrying astronauts. The fellow’s timing is amazing… just as the US and Europe are looking for a way to stop paying Russia for manned Soyuz transports carrying our astronauts to the space station. The surprise donation to NASA of two identical space telescopes by the United States National Reconnaissance Office has put NASA in a bind. They are essentially brand new Hubbles… a super gift, but then comes the hundreds of millions of dollars needed to turn them into scientific instruments. Read about a petition to make use of these (potentially) amazing gifts for astronomy. NASA plans to launch the Orbiting Carbon Observatory (OCO)-2 mission from Vandenberg Air Force Base in California on July 1, 2014. The OCO-2 mission will be NASA’s first dedicated Earth remote sensing satellite to study atmospheric carbon dioxide from space. I plan to be there! Additional information about the mission can be found on the NASA site. Why has it taken so long? There was an attempt to launch a climate satellite early in the Bush administration… a launch that mysteriously (even suspiciously?) blew up. After a second failure, budgets for climate science were slashed and satellites cancelled, while the GOP Congress passed measures eliminating Earth studies from the NASA mission and tried to do the same to NOAA! There were some interim sats and their work has universally confirmed global warming models, but at levels of accuracy that still allowed denialists to wriggle and squirm. One can hope the new satellite will put doubts to rest and that mature citizens will rally behind whatever the science shows. One can hope. No, the response is hatred of scientists and all “government.” Ponder that. The question I have for (the recent, neo-crazy version of) conservatives is this: “Do you really want to base the entire credibility of your whole movement on obstinate rejection of science?” On a fabulated image that scientists know less, are dumber, more herd-like and less credible… than a hireling propagandist on Fox News? I hope you all have been enjoying the remake of COSMOS. (Sundays: Fox Entertainment and Mondays on National Geographic.) While episodes one and two were merely very good — with some stretches of preachiness — we were awed by the third installment, which was stunning on a par with… even exceeding… the Carl Sagan original. Yes, all right, I’m biased: Edmund Halley has always been one of my heroes and the depiction of comets (so well-executed by show science director Andre Bormanis) seem to have been taken from my doctoral dissertation! But none of those elements mattered next to the awesome vistas and deeply-moving messages of this exciting and enlightening show, so well delivered by Neil deGrasse Tyson. If you have not watched… and heavily proselytized… this event, then you must have simply fallen into a torpor. Wake up! It’s time to restore our civilization’s confidence and sense of can-do wonder. Just ponder one absolutely amazing fact. Last week, it was announced that a telescope on the south pole, financed by your tax dollars, just mapped out the inflation event that occurred in the first trillionth of a trillionth of a second of the Big Bang. Is that the amazing thing Brin is referring-to? No, it is not. Or was it last year, when your taxes paid to send a capsule threading the narrow atmosphere of of a distant planet. A capsule that then — in the exact-right millisecond — deployed a parachute, that precisely deployed a rocket, that used a crane to gently lower a complete, mobile science lab onto %$#! Mars… was that the amazing thing? Admit it. You didn’t do that. Now admit it reveals that something has gone very wrong with us. Yes, restoring that sense of confidence and joy is what COSMOS is about. …there is this rumor going around, that some of the producers — perhaps Neil himself — plan to announce a surprise stunt to “beam” some of these messages into space by radio dish. And if it turns out to be true, well, that would be a major blunder. Ever increasing numbers of prestigious scientists are coming out against such “METI” stunts, which arrogate a peremptory right to change one of our planet’s major observable characteristics without ever exposing the endeavor to critique by scientific peers. There are no good reasons to do such a thing, without discussing it with humanity’s greatest sages and with the public involved. Indeed, a number of us have come up with some very good reasons not to! So please, Neil, just in case the rumor is true, stay scientific and don’t do it. And if you do it anyway, recall that a Klystron can transmit at very low power. Talk to us…all of us. You’re doing a great job at that. Leave such stunts for a later, more-knowing generation. …see this very moving essay: “It’s time we fell back in love with science,” which bemoans how British attitudes toward science are becoming crazier… as in America. “When science used to tell us things we didn’t want to hear, we listened. Now we stick our fingers in our ears and say “lalalala” before finding someone who will tell us what we do want to hear.” writes Alex Proud in The Telegraph. 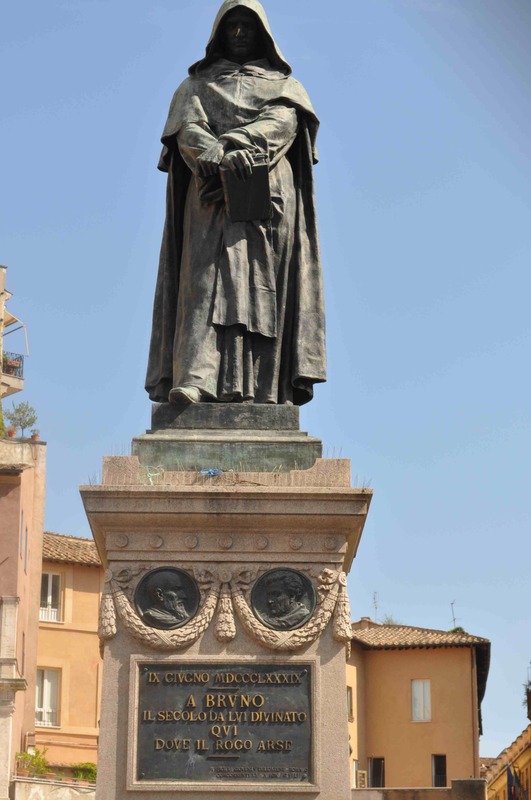 Interesting articles spin online, about how COSMOS producers chose in episode one to focus so long and hard on Giordano Bruno, whose immolation in Italy cast into stark focus the fear and wrath provoked by heretical beliefs. (I was surprised that Tyson did not pose next to the statue of Bruno that now towers over the square where he burned.) Although I speak of Bruno often, I never portray him as a saint of science. Rather, he was a paladin of confrontation… the top contrarian of an era that was just learning how to accept the prodigious benefits of open and fair argument. And this fellow contrarian appreciates him in that ornery spirit. As far as science goes, well, this article (Did Cosmos Pick the Wrong Hero?) compares Bruno to the Englishman, Thomas Digges, who was quietly doing much more to bring the ideas of Copernicus into the mainstream of European thinking, without the accompanying in-yer-face theological dross that Bruno added, that multiplied his troubles. Oh, certainly, I am more like Bruno, I suppose. But with just enough maturity to know that civilization is actually pushed forward by more modest men and women of science. Less flashy than Cosmos, the “inFact” series by science journalist Brian Dunning, aims to offer net-era brevity to snappy-but-wise riffs on science for the interested layman. I especially recommend the short piece on global climate change which aims — above-all — to calm folks down and get us no longer making science decisions based upon our political party. Compact enough to get your crazy uncle to watch! Oh, also see his video about Tesla! Kind of impressive. I would have added a couple of notes… e.g. that the mavens of weather forecasting make vastly more money than climate scientists and have no vested interest. They are the geniuses who transformed the old, 4 hour joke of a “weather report” into a ten day miracle. They know their stuff and have no reason to foist a scam on us… their “grants” are safe. Yet all of them agree we should take reasonable steps to become more efficient and reduce the worst effects of climate change. Still, a very compact and cogent missive. I recommend it highly, especially as a bridge for all your crazy uncles, out there. Have you been paying attention to the news just in recent weeks? Again, let me reiterate… a special polarimetry telescope (at the south-freaking pole!) has tracked the subtle light twists that may show the gravity wave echoes of the first pico-pico-second of the Big Bang? (Formerly, the cosmic background studies could only penetrate to about 300,000 years AB (after bang.) Your taxes paid for this. An earlier, science friendly Congress voted to be the kind of civilization that invested in such glories. Run into the street about this! Better yet… make sure science-friendly folk aren’t lazy about voting, this year! Think of the Supreme Court and get busy! And in the same month: we tracked an asteroid passing in front of a star and found it had rings! And also… we (you and me and others) discovered a new dwarf planet out there beyond the Kuiper Belt. A little more than a month ago, Kepler scientists have confirmed the existence of 715 new exoplanets — four of which are located within their star’s habitable zone. It’s the single largest windfall of new confirmations at any one time. That’s a 70% increase… in just one announcement. And we’re all taking part. See a chart of astronomers and physicists who have the most twitter postings and followers. And how many years they’ve been at it. 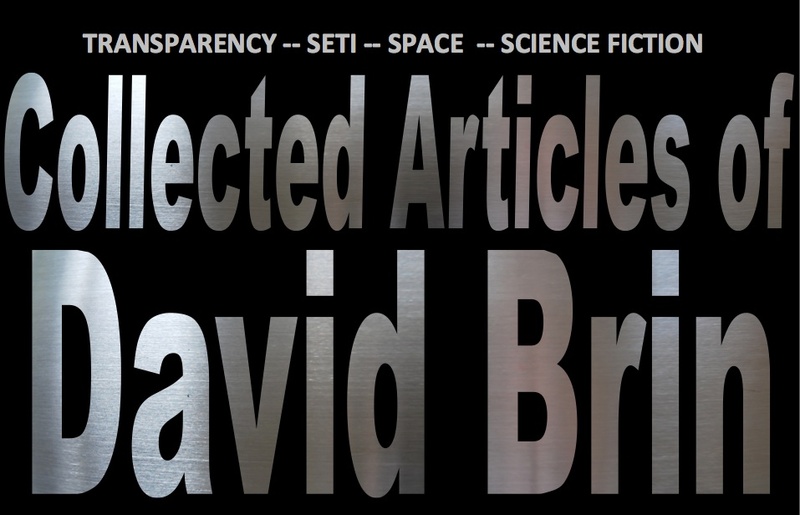 All told, I suppose I score pretty well (@DavidBrin on Twitter). Especially since I don’t tweet that much… and science is not all I talk about! Still, I won’t compete with Neil deGrasse Tyson. The New COSMOS is a wonder. Drag everyone you know into watching. It is a tonic for a scientific civilization, fighting to save itself from those agitating for a new Dark Age. I just attended the NASA Innovative and Advance Concepts group (NIAC) symposium at Stanford — (I am on NIAC’s Council of External Advisors) — watching and appraising and questioning terrific presentations about future-potential “game-changing” space technologies. In four days the recipients of NIAC seed grants, showed us how NASA’s small but strategic investments in exceptional… even risky… technologies might prove valuable — even vital — if given a chance. Other keynotes included my friend Peter Norvig, head of research at Google (also hugely inspiring) and SETI Institute chief scientist Seth Shostak, who gave a clever-dynamic speech about how likely it is that “everything will change.” We have our disagreements, but Seth does deliver high octane big-think. There was also an interesting reception and speech by two experts about venture capitalism in space, hosted at SETI institute HQ, of all places. Other talks were even more amazing. Can we see inside super-dangerous volcanoes like Vesuvius? Hiroyuki Tanaka of the University of Tokyo reasoned that the throat of a volcano could be “x-rayed” with energetic muons produced in cosmic-ray showers. The number of muons passing through the volcano would depend on the density of intervening rock, so measuring the number of muons passing through various parts of the volcano could yield a crude, 3-D view of the interior. So, can we use this in space? One of the fellows with a NIAC grant showed us even more spectacular potential application… a way to peer inside asteroids! Then there’s Red Whittaker who has made progress developing a robot that can lower itself (rappel) on a cable into some of the lava tube tunnels that we’re now pretty sure exist on the Moon and Mars, after we’ve spotted some of the “skylight” openings that have caved-open, exposing some of them… potentially ideal places for early human visitors and colonies to inhabit. Those settlers would then supplement the caves with other NIAC innovations! Like with “printed” concrete that uses sulfur to replace water. Or polymers to bind regolith with water – only the water gets recovered for re-use. Robert Hoyt talked about his group’s truss-making “trusselator” … then a biomedical team reported on their scenario for using “torpor” — human hibernation — for spaceflight! (Just don’t leave a crazy AI in charge, while you sleep.) Another bio group has been studying ways to tailor and refine organically-derived useful materials in space. Then… how about combining fusion and fission, maximizing neutron use and getting the best of each for a very high ISP rocket! Here’s a great one studied by two separate groups… 2-D “landers” that are like sheets of paper and flutter down to planets, needing no complex rockets etc… with printed circuits and instruments! Then we saw an effort to mimic Geoff Landis’s great sci fi story “A Walk in the Sun” by having a rover circumnavigate the poles of Mercury or the Moon, moving just fast enough to stay in twilight, where there’s solar power, but not so much you get scorched. Another team wants to use a base station lander to aim reflected empowering sunlight at its rover. (I actually quite liked that one). Even if no rogue state attacks with an EMP… the sun eventually will. We should have been hardening the grid and civilian electronics for 30 years. Indeed, such hardening would make an attack less tempting and thus less likely. It is called robustness and should be a core national – and civilization-wide – goal. For two weeks, humans and a humanoid robot lived in a simulated Martian environment inside a habitat module– in Utah! A NASA experiment to seek ultra-low temperatures — as low as 100 pico-degrees Kelvin — will be put aboard the Space Station in order to eliminate the effects of gravity. The hope is to study deep quantum-statistical effects of matter, such as Bose-Einstein condensates. The NASA research team believes that they will be able to create work in this proposed coldest known location in the universe in intervals of up to 20 seconds and that they may be able to create atomic wave packets that are capable of being seen by the naked eye. In other cool NASA news that gets far-out but plausible… a new series of “NASA-Inspired Works of Fiction,” has grown out of a collaboration between the National Aeronautics and Space Administration and science fiction publisher Tor books. The partnership pairs up novelists with NASA scientists and engineers, who help writers develop scientifically plausible story lines and spot-check manuscripts for technical errors. (See also my novella, Tank Farm Dynamo.) What is so cool is how this kind of return to the old, confident, can-do spirit is exactly what we need to counter act the swamp of dystopias and same-same hopelessness that currently infests YA fiction. Okay, saving the dreamiest for last. It seems that a whole new generation is being awakened to the delightful vision so many of us had, in the 1980s… of artificial colonies in orbit. Sure the recent movie Elysium portrayed a “Stanford Torus” serving as the ultimate enclave-metaphor for class oppression. (It also had a magical force-field that somehow was useless against incoming ships.) But even in that case, the gorgeous habitat become a source of hope for all humanity. This dream — which goes back to J.D. Bernal’s marvelous design of 1929 — is being given a kick by some low-scale NASA backing. e should all help re-introduce another generation to this notion, which is the ultimate expression of the confident, assertive, Can-Do Spirit we so desperately need, here on Earth. Let “we can do it” be the theme for a century that begins this year! All right, this is going to get a bit dense and weird, as we glimpse discussions of time travel. But first… a string of wonderfully interesting bits of science news! A lead author suggests “Consciousness depends on anharmonic vibrations of microtubules inside neurons, similar to certain kinds of Indian music, but unlike Western music, which is harmonic.” How cool and weird! Only I am less interested in the mystical implications about roots of consciousness than whether this nails in “intracellular computing” as a major part of brain function. If so, then that boosts by many orders of magnitude how many transactions take place to comprise our minds. And many more Moore’s Law doublings will be needed before that number can be replicated, in silicon. Is that good news or bad news? Will this delay the arrival of friendly machines who will solve our problems and help us become better, too? Or will it save us from the imminent arrival of Terminator/Skynet, giving us time to ponder how to do these things right, as Max Tegmark proposes? Tradeoffs that are discussed in this new book, The Second Machine Age: Work, Progress, and Prosperity in a Time of Brilliant Technologies, by Erik Brynjolfsson and Andrew McAfee. And, of course, well… I explore them pretty extensively, too. What are the design tradeoffs in delivering actual immersive augmented reality glasses, of the sort I called “tru-vu goggles” in EARTH (1989)? Google Glass finesses the problem with a very narrow angle of view, offset from straight-ahead. In this article you can see some of the problems… and how a new company has come up with clever ways to solve them. At Google last week, I described to Head of Research Peter Norvig the reasons why I thought Google was keeping Glass simple, and not covering the user’s visual field, or offering face recog features. He said yep. The company with big pockets cannot afford to be the first to offer full Augmented Reality. Not when the first ten years will be (as I describe in fiction) filled with accidents and lawsuits. All right then… David Deutsch, a pioneer of quantum computing and a physicist at Oxford — as well as the author of The Beginning of Infinity — came up with a simplified model of time travel to deal with the Grandfather paradox*. He solved the paradox originally using a slight change to quantum theory, proposing that you could change the past as long as you did so in a self-consistent manner. The original article cited here maintains that, to be consistent with Deutsch’s model, which holds that you can only change the past as long as you can do it in a self-consistent manner, Wilde and colleagues had to come up with a solution that would allow for a looping curve back in time, and copying of quantum data based on a time traveling particle, without disturbing the past. “If an adversary, if a malicious person, were to have access to these time loops, then they could break the security of quantum key distribution,” Wilde said. “That’s one way of interpreting it. But it’s a very strong practical implication because the big push of quantum communication is this secure way of communicating. We believe that this is the strongest form of encryption that is out there because it’s based on physical principles.”Such encryption is believed to be unbreakable — that is, as long as hackers don’t have access to Wilde’s looping closed timelike curves. In a recent paper, Robert J. Nemiroff and Teresa Wilson, suggest that we actually search for time travelers… via Internet searches, by seeking a prescient mention of information not previously available. Their first search covered prescient content placed on the Internet, highlighted by a comprehensive search for specific terms in tweets on Twitter. The second search examined prescient inquiries submitted to a search engine. Whereupon, lo and behold… “no time travelers were discovered.” Although these negative results do not disprove time travel, given the great reach of the Internet, this search is perhaps the most comprehensive to date. Well, well, didn’t the authors kind of assume that the time travelers either want to be found or else that – when back home in the future – they failed to do a web search for traps like the one laid by Nemiroff and Wilson? It reminds me of the “Invitation to Extra-Terrestrial Intelligences” that was issued on the internet by the late professor Allan Tough, who felt certain that mechanical envoy-lurkers — waiting in the asteroid belt for millions of years — had already inveigled their way into our networks to read our web pages. (And much more? Are there NSAliens out there?) Further that they were only awaiting an invitation to speak up and announce themselves. Allan was brave enough to invite me to post my own variant (deviant?) invitation… or else decryption of why lurkers might refrain and just keep lurking. All the same logics apply to time travelers, I’m afraid. Oh, that invitation of mine to lurkers? It became a number of chapters in Existence! For an exploration of time travel scenarios in science fiction, see a list of Time Travel in Fiction, or the more recent anthology The Mammoth Book of Time Travel SF, with short stories by Silverberg, Rusch, Levinson, Swanwick, Priest and others. Two newly discovered species of spider — in far-apart Peru and the Philippines — make decoy spiders to place on their webs, each one about the size of a half-dollar, constructed from debris and food carcasses, with eight legs radiating from its bulky center. The tiny sculptor dwells inside her creation. Batteries will be vital in the new world of dispersed and sustainable power systems. The prospect of low-cost storage has long been a nirvana for the renewable energy industry with the intermittent nature of wind and solar energy restraining their competitiveness against fossil fuels such as coal. Now researchers have found ways to use cheap/abundant materials in Flow Batteries. Coolest commercial mini-drone I’ve seen so far. Did little ISON — fairly small as comets go — survive its daring-close passage by the sun. She’s already provided lots of valuable science. But will she also give us Earthers a fine eyeball-show in mid-December? As we bite our fingernails, awaiting the re-emergence of Comet ISON, I flip through my old doctoral thesis (on comets!) Meanwhile, have a look at XKCD’s terrific cartoon about what comets actually think of the Sun. Folks who want a much more thorough and lovingly detailed (hard science fictional) look at these strange creatures might have a look at Heart of the Comet! …and ponder how valuable it might be to become a truly spacefaring civilization. …here’s a truly excellent editing of my interview about SETI and the Fermi Paradox distills the crucial matters into just over three minutes. Well done, Daily Galaxy. Why worrisome? Sounds like one more fun outgrowth of the very successful CubeSat program, right? In fact this is part of a trend I’m not particularly fond-of. For-profit groups exploiting space-fans by providing a vicarious — and scientifically meaningless — “participatory experience” that ultimately boils down to a kind of subsidized pollution. Okay. This once isn’t so bad. So a hundred silly disks get scattered on the Moon’s surface. Far worse are the idiots who have got their mitts on old radio tracking and communications dishes that were paid for with taxpayer funds and that are now obsolete and cheap to acquire… suddenly proclaiming that they will beam forth “messages to ET” on behalf of humanity, for a fee. Either spitting Dorritos ads at Gliese 382, or else jumbles of thousands of “yoohoo shouts” from individual zealots who pay $20 per millisecond of ego-time aimed at a speck — a stupid stunt, whose small but real potential for endangering humanity the perpetrators blithely ignore. Compared to that, this lunar thing seems pretty harmless. Still, it is a general phenomenon we should keep an eye on. Right and left-wing nostalgia junkies aren’t the only kinds of suckers… I mean eager potential sources of revenue… out there, ready to plonk down cash for intangible participation in a delusion. These “science stunts” show that even on the side of humanity that loves the future, there are still folks with far more zealotry than sense. But did I have to tell you that? Ever been to Comicon? Ever talked to a Star Wars fanatic? Enough said. Oh, but let me add a coda: here’s a FREE audio podcast of one of my coolest recent stories — “Mars Opposition” — in which (alas) folks like me who took part in an earlier stunt… harmlessly “signing” a Mars rover… get what we deserve! Me? I like the plan to investigate asteroids by dragging small ones to near lunar orbit. It hits the sweet spot of challenging yet do-able, exploring deep-space technologies and methods… while helping new companies investigate possible treasure troves of asteroidal resources. Sure beats returning to the sterile and (currently) useless Moon! In any case…China plans to launch the Chang’e 3 lunar probe on Monday — the first time China will attempt to soft-land on the moon, a feat accomplished, so far, only by the U.S. and the former Soviet Union. U.N. officials announced plans to establish an International Asteroid Warning Group to intercept and divert dangerous asteroids. Meanwhile, the Hubble Space Telescope will begin peering just past some tight clusters of galaxies, using their gravitational lensing effect to attempt to spot objects ten times fainter or farther away than normally possible. NASA has outlined a new plan — K2 — to resurrect the Kepler Planet hunting Probe — using solar pressure to stabilize the probe and restore its ability to reliably point toward at distant exoplanets. NASA‘s Lunar Laser Communication Demonstration (LLCD) has made history using a pulsed laser beam to transmit data over the 239,000 miles between the moon and Earth at a record-breaking download rate of 622 megabits per second (Mbps). That’s a huge breakthrough. Incredibly bright black hole puzzles astronomers. Researchers have confirmed a suspected dust ring in the orbit of Venus. NASA contest — open to high school and college students — challenges teams to create the next-generation space buggy — a vehicle capable of exploring the surface of other worlds. Could we store data for one million to one billion years, using a new storage medium based on tungsten and graphene oxide? The chosen information carrier is a wafer consisting of tungsten encapsulated by silicon nitride. Tungsten was chosen because it can withstand extreme temperatures. A QR code is etched into the tungsten (see picture) and is protected by the nitride. Amazing: nanoparticles, guided by synthetic DNA to self-assemble into large-scale composite materials. What happens to the human brain when it slips into unconsciousness? “In terms of brain function, the difference between being conscious and unconscious is a bit like the difference between driving from Los Angeles to New York in a straight line versus having to cover the same route hopping on and off several buses that force you to take a ‘zig-zag’ route and stop in several places,” said lead study author Martin Monti, of UCLA describing functional magnetic resonance imaging (fMRI) studies of this transition. A cute summary of Nobelist economist Paul Krugman’s theory of interstellar trade. A film, Pale Blue Dot — takes the Kerbal Space Program quasi seriously! Only then it gets elegiacal and beautifully moving. A cool article about space megastructures contains embedded a nifty animated depiction of a Niven Ringworld. Now back to nail-biting. Come on ISON. You may be little, but you’re tough! 150 years after Lincoln at Gettysburg… Can we maintain our resolve? Our Union? Drew Gilpin Faust, the president of Harvard University, is a historian and author of “This Republic of Suffering: Death and the American Civil War.” In her recent article – 150 Years after the Gettysburg Address, Is government by the people in trouble? – Dr. Faust offers an eloquent and quite moving exploration of the context in which Abraham Lincoln transformed his earlier “hopeful” rhetoric into the more hardened sense of passion that spoke to his contemporaries’ aching hearts about “dedication” and “resolve” — a determination that something more must come out of all their shared sacrifice than mere preservation of a national union. Seared by fire and blood, the newly emerging version of the United States of America would have to be something finer. In the spirit of a “new birth of freedom,” it must forever aspire to be better, then better still. Only with this vital difference. Both men died before completing their tasks. But, unlike those who followed Pericles, we appear to have been ready, after Lincoln, to forge ahead in victory and determination. His words, burning in our hearts, continued making a difference at crucial moments for six succeeding generations, so that the Great Experiment thrived and survived every intervening crisis. — a dilemma that we handled – if not perfectly – then less-horribly than any other nation that was ever so-tempted. In part because of the moral ember that Abraham Lincoln sealed into our hearts, smoldering there to remind us that democracy and wealth and power and even freedom become meaningless, unless they accompany a fierce ambition. To aspire. To become better. Together. That is my brief rumination upon this 150 year-old epochal masterpiece of sadness and solace, of courage and resolve, of dedication to our common project, our shared experiment, our unfinished work called America. Only there is more… there is always much, much more. Such as how Lincoln’s Gettysburg Address relates to this time. More than ever, it is pertinent to our present set of crises. 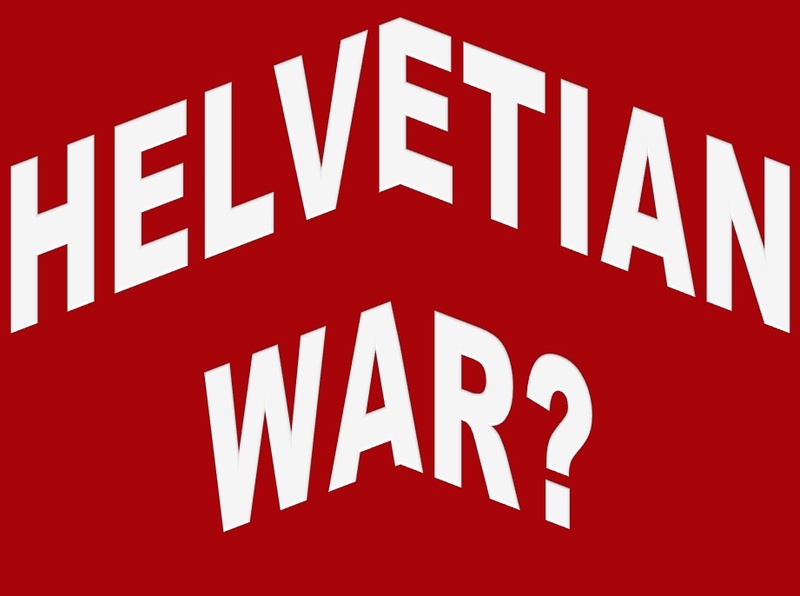 For, now we Americans are engaged in a new phase of civil war. Not yet violent to any significant degree and we can pray to almighty providence that things will stay that way. But there is no question that forces are at work upon this continent, testing whether this nation, or any nation so conceived, can long endure. Look at the political map of our bitter, partisan divide, and just try telling yourself that it’s not the very same struggle. Not over slavery or freedom or states’ rights, which — for all their importance — were surface matters of dispute, symptoms of a fissure that plunges deeper than even those great matters. So deep, because America and Americans seem divided by differing, incompatible dreams. One side of our national character hungers for change and tomorrow. To treat the future – the range of possible futures — as ambition-attracting terra incognita, across which our children will explore and stride, better than we are in every way, even if that means repudiating many of our now-unclear assumptions and errors! Preparing those much-better generations for a boundless future is our dedicated proposition. Our mission. But there is an opposing passion — the temptation to wallow in nostalgia, romanticism, sanctimony, authority and the comforting rigidity-of-caste that dominated nearly every other civilization, across 6000 years. It was called feudalism and humanity’s greatest heroes fought to liberate us from that beastly, limiting and dismally stupid way of life. Boringly predictable, heard in every ancient palace, this rationalization propels ingrate-lords who call themselves “job-creators” while creating few jobs, except for the propagandists that they hire en masse to rail against Abraham Lincoln’s high aspiration. Or against scientists, teachers, professors, civil servants, journalists, economists, skilled laborers, law professionals, diplomats, medical doctors — every profession of ambitious, forward-looking knowledge and skill. But one core thing is under attack, more than any other. 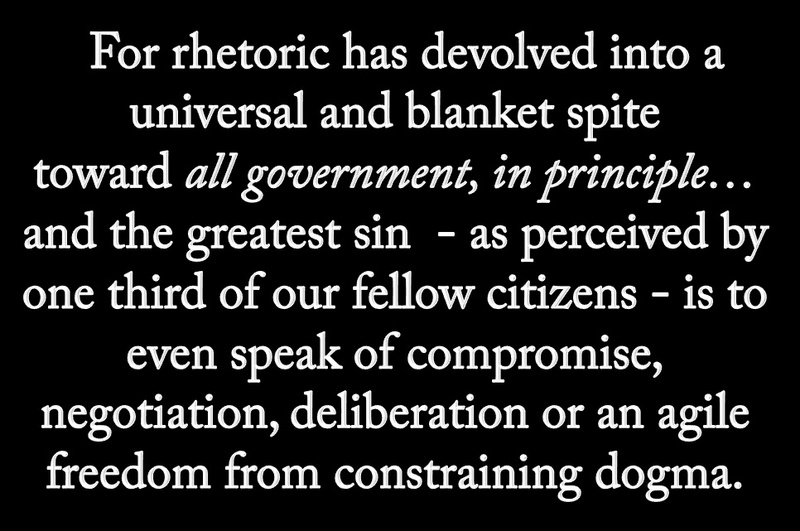 That is the very idea of shared endeavor, of joint action, of common projects that are mediated-by and consensus-chosen through the process of politics that we call “government”… this very idea is denounced as anathema, as repulsive, as inherently evil. How far has this mania gone? So far that even members of the United States military officer corps are experiencing real fear for the republic that they love. To which they dedicated their full measure of devotion. As happened in 1861, a major fraction of our countrymen have been talked into suckling nostalgic future-rejection and caste-romanticism. Enraged, they’ll fight for New Confederacy lords whose “plantations” now span Wall Street, cyberspace and ten million secret accounts in foreign private-banking havens. How ironic, for this coincides with the passing of the Greatest Generation — men and women who fought down the curse of Hitlerism, who overcame the First Great Depression, who embraced the plan of Marshall, Truman, Acheson and Eisenhower to contain communism peacefully until its fever broke… without nuclear annihilation. All so that their unique nation might live. A generation that created the mighty American middle class, amid a burst of entrepreneurial productivity so fantastic that their children could afford to take on ancient evils that all others had taken for granted, like racism, sexism and environmental blindness. The brave men, living and dead, who struggled in those mighty causes shared one trait more common than any other. The Greatest Generation adored Franklin Delano Roosevelt — once compared lovingly and in all ways to Lincoln — but who now one third of our fellow citizens have been talked into equating with Satan Incarnate. How long until the same thing is done to Honest Abe? This ongoing struggle is not (despite propaganda) about ‘left-versus-right.’ Not when entrepreneurship, small business, federal fiscal responsibility and the middle class always do far better under democrats than under the Republican Party. We could fill page after page with clear evidence that the father of capitalism and the “First Liberal” — Adam Smith — would today be a democrat. No. When the rhetoric has devolved into a universal and blanket spite toward all government, in principle, and when the greatest sin — as perceived by one third of our fellow citizens — is to even speak of compromise, negotiation, deliberation or an agile freedom from constraining dogma, then we have come full circle. One hundred and fifty years after Abraham Lincoln urged our predecessors to advance the unfinished work which the heroes of Gettysburg so nobly advanced, we should read his words again, letting them roll in our heads and off our tongues. And then we must rise to our feet, in similar, steely resolve that the epochal achievements of those who came before us shall not have been in vain. …but also with great projects that we choose by “governmental” processes that — even when filthy-political — still often launch us forward. To conquer polio and build internets. To educate one and all. To create the world’s finest universities. To span the continent with highways and dams and electricity… then to preserve much of the rest for future generations. To probe ahead, with the tools of science, for mistakes to catch and solve in the nick of time. To keep the world’s longest and greatest peace. To step onto the surface of the Moon. To aim for the stars. But first, it will take resolve — stopping those who would end the Experiment amid dogma and rage. We intend to welcome them back, with charity for all, when this latest fever breaks! Abe Lincoln showed us how. — that government of the people, by the people, for the people, shall perish from the earth. The dawn of a “predictive” era? Help crowd-fund the new Museum of Science Fiction — to be established in Washington D.C. The new museum plans to have interactive exhibits that explore the history and ideas of science fiction — and the intersection of science and the imagination. Right now they are raising money through Indiegogo for a preview location as a first step toward the MSF. Take a look at their video — and help fund this worthy project. Then, some big news: The Chinese Science Fiction Congress in Chengdu will, in a couple of weeks, honor me with a Galaxy Award for “most popular foreign author” among SF readers in China. My thanks go out to all the voters, readers, authors and professionals in the burgeoning Chinese science fiction fandom who participated in this selection, “uplifting” me to this honor. I am thrilled and deeply moved. Indeed, nothing gives me greater optimism about the human future than the rapid rise of science fiction in China! You will see why, next year, when Ken Liu’s excellent English language translation appears for Liu Cixin’s spectacular three-part novel, “The Three Body Problem,” which was a tremendous leap forward for Chinese SF. And more thrills are coming. The winner of the Best Novel category in this year’s China’s Xingyun (Nebula) Awards is a book that paints a pessimistic, dark view of a corrupt near-future China. The Waste Tide by Chen Qiufan takes place in the 2020s, and depicts a dystopian future — the kind of literary exploration that shows a nation self-confident enough to relish and benefit from dark criticism. In other words, how networked problem solving systems can make use of human beings as intelligent nodes, sensors, actuators and solvers of sub-problems, empowering a dispersed system to crowd-source overall solutions… pretty much as I depict happening in our near future, in EXISTENCE. I hope someone will report in from the event in the desert and let us all know how it goes. Let’s hope this trend will bode well for us all. Hordes of bankrupt French invade Switzerland to get their hands on their “stolen” money — such is the imaginary scenario cooked up by the Swiss military in simulation exercises recently. Sound familiar? In my novel EARTH (1989) people of the year 2038 look back upon the horrific “Helvetian War” of the 2020s, when 30 developing nations declared hostilities with Switzerland and other banking havens, in order to track down the trillions stolen by former kleptocratic lords. What started as a legalistic “phony war” allowing the beligerants to seize property quickly turned violent and eventually neighbors in Europe joined in…. turning the Glarus Alps into radioactive slag. An unusual scenario(!) that fans found both fascinating and unlikely. Unlikely? Hm. So much so the Swiss Army is taking it seriously, it seems. Indeed, let me go farther. Something like it is starting to look (alas) unavoidable. Then there’s this. One fan wrote in “Hey Dr. Brin, chalk up another one for your predictions registry! #2 of Cracked.com mentions that Sweden is “designing toilets that will extract the precious phosphorus from our [urine].” All right. That one was from Existence. In that novel I portrayed denizens of our near future using the “Phosphorus-recovery Urinal” or P.U. Heck, I thought that up mostly for fun! Eep. Even slightly off color tech humor is coming true, now! And speaking of bold predictions: Forbes presents Three Scenarios for funding Interstellar Travel, in a review of Starship Century: Toward the Grandest Horizon, the fascinating anthology of essays and stories about interstellar flight, edited by the Benford Boys, with contributions by Stephen Hawking, Freeman Dyson, Peter Schwartz, and me… among others…. My friend Dr. Erik Virre is interviewed about the latest X Prize competition to build an honest-to-gosh Star Trek Medical Tricorder. The devices are going to measure vital signs, assess medical conditions, and wrap all the systems into a useable mobile platform, and the winners announced in the summer of 2015. And see: How Science Fiction gave birth to UAVs and GPS. On “The Raiders Minimization” episode of The Big Bang Theory, Amy Farrah Fowler watches Raiders of the Lost Ark for the first time with Sheldon Cooper. Afterward, Amy explains, “If Indiana Jones weren’t in the movie, the Nazis would have still found the Ark, taken it to the island, opened it up, and all died, just like they did.” Hence the show’s smartass writers proclaim a “gotcha” on Steven Spielberg. … sign up for the World Science Fiction Convention in Spokane WA in August 2015, with Guests of Honor David Gerrold and Vonda M. McIntyre. There will be a bonus “Train-Con” for those using Amtrak to get to Spokane, from either Seattle or Chicago. In the Guardian: Why Science Fiction isn’t just for geeky boys. In this moving interview on NPR, Terry Pratchett, who suffers from Alzheimer’s, describes how he used dictation software to revisit and revise a new edition of his very first novel, Carpet People (first published in 1971!). John Ringo has off-color fun leading you through his “proof” that a zombie apocalypse is inevitable. Some excellent advice for J.J. Abrams before he locks in his plan for the renewed Star Wars universe. And I agree with the points in this lovely little video! Still, as you all probably know, my quibbles run a whole lot deeper, down at the level where the prequels actually betrayed the fundamental moral elements of the earlier trilogy! Where they actually started conveying some truly vile messages. Or at least, that was my case as “prosecutor” in the fantastically fun (and wise!) volume STAR WARS ON TRIAL. And yes. I have long promised you that extensive essay on James Cameron’s wonderful epic Avatar… and how it does not preach the things that Mr. Cameron thinks it preaches, alas. The essay is finished. Looking for the right venue. Top news… if it proves out… The amplituhedron, a jewel-like geometric object at the heart of quantum physics: As a physicist, I find this one of the most exciting advances (again, if true) in quite a while. Einstein said something like “follow the elegance” and if this is true, then it is elegance. It is also lovely in its weirdness. Why are American Health Care Costs So High? A bizarrely sensible and entertaining perspective from author John Green. And amazingly, it is not political! Well, it does demand reason and common sense and a willingness to step away from pre-conceptions… so nowadays just doing that is a political act. But do watch it. A study shows for the first time that lifestyle changes — in diet, exercise, stress management and social support — may result in longer telomeres, the parts of chromosomes that affect aging. Oh, but a century won’t suffice, no? A kickstarter campaign seeks funding for The Last Generation to Die, a provocative short science fiction film about the near future when we must wrestle with the arrival of age reversal or rejuvenation. The tradeoffs and emotional quandaries. And for my own take on the tradeoffs, take a look at my essay: Do We Really Want Immortality? While we’re on the subject, see Larry Page’s most recent effort to use his wealth (with some help from friends) to fund Calico, a win-win initiative to fight aging and disease, and help us all to live longer. 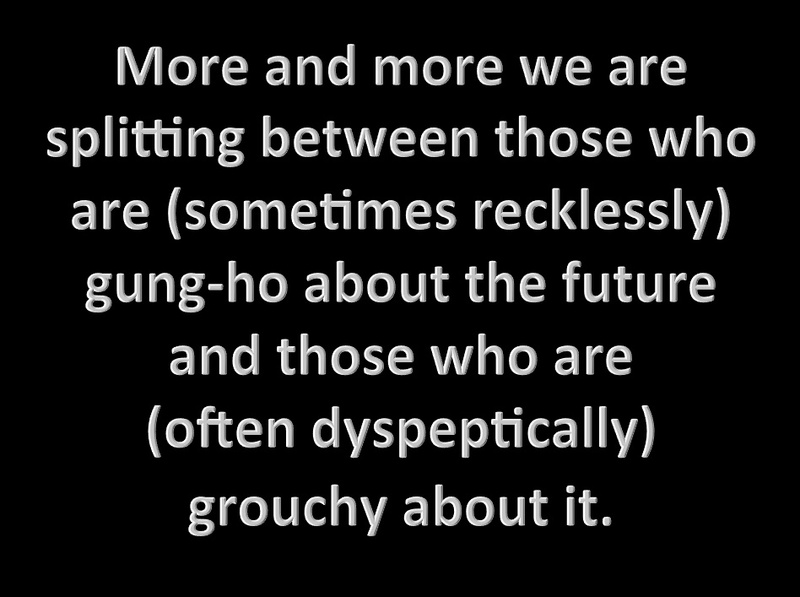 Ah, but more and more we are splitting between those who are (sometimes recklessly) gung-ho about the future and those who are (often dyspeptically) grouchy about it. This one is sure to spark screaming matches: Adderall for All: A Defense of Pediatric Neuroenhancement. A stunning example of terrifying yet inspiring animal altruism. A giant leopard seal tries to teach a diver how to survive. Actually, now that I think about it… the story is almost identical to a scene in Existence! Simply flat out mind-boggling cool: Freeman Dyson on Warm-blooded Planets in the Outer Solar System . I attended this talk by my brilliant friend, whose stunning ideas about “greenhouse organisms” that could sustainably colonize and “green” icy moons in space, is utterly fascinating. This was at the recent Starship Century conference at the Arthur C. Clarke Center for Human Imagination. The next year or two should be big for planetary science. A possible (unlikely) “comet of the century“… plus another comet skating past Mars. The Dawn mission will reach Ceres in 2015. The European Space Agency’s Rosetta spacecraft will be escorting the comet Churyumov-Gerasimenko around the sun that year, while NASA’s New Horizons mission will be reaching Pluto and its moon Charon. Getting a little closer to home… So cool. You get to see what no ancestor saw before 1960: a full rotation of the moon. Even closer. Congratulations to Orbital Sciences for launching a supply capsule to the space station in September. Competition with SpaceX is a good thing. Though the two endeavors are not exactly comparable. For example, while Elon’s SpaceX has developed its own new rocket and thousand innovations entirely in-house, Orbital Sciences is struggling to find a reliable engine for its rocket: “The NK-33 engine that powered Antares’ first flight was built decades ago by Russia’s Kuznetsov Design Bureau and is no longer in production. Further, Orbital is uncertain about the quality of Aerojet’s remaining stockpile of 23 NK-33s.” Well, they are at least proving there’s a niche for clever recycling! Aerobraking? That’s for sissies! How about … litho-braking! In a recent test, ESA researchers sent a prototype careening into 10 tons of ice at a deceleration of 24,000 times the force of gravity. The main shell of the payload survived the deceleration “scuffed.” Next up: tests containing electronics. Possible an ideal penetrator to study the oceans of Europa? Oh, so many questions, first! Extraction… will the recent interest in asteroids stay stoked? Scientists have searched through the current database of around 9000 near-Earth objects looking for those that could be maneuvered into an accessible orbit by changing their velocity by less than 500 meters per second. Researchers conclude that 12 asteroids meet this criteria. They call this new class of asteroid “Easily Retreivable Objects” or EROs. I have been backing this kind of idea ever since reading John Lewis’s pioneering and visionary MINING THE SKY: Untold Riches from Asteroids, Comets and Planets, way back in the 1980s. Preventing extinction-level events: The European-backed NEOShield Project aims to develop defenses against killer Near Earth Object (NEO) asteroids. Their plans include orbital reconnaissance, as well as the hypothetical launch of kinetic impact spacecraft that would deflect problematic asteroids from their earth-bound trajectory. Watch the animated simulation video. China announced Wednesday that it plans to put a rover on the Moon by the end of the year. The Chang’e-3 Lunar probe will include a six-wheeled lunar rover, which will work on the surface for about three months. China’s goal: landing humans on the Moon. Though there is competition. 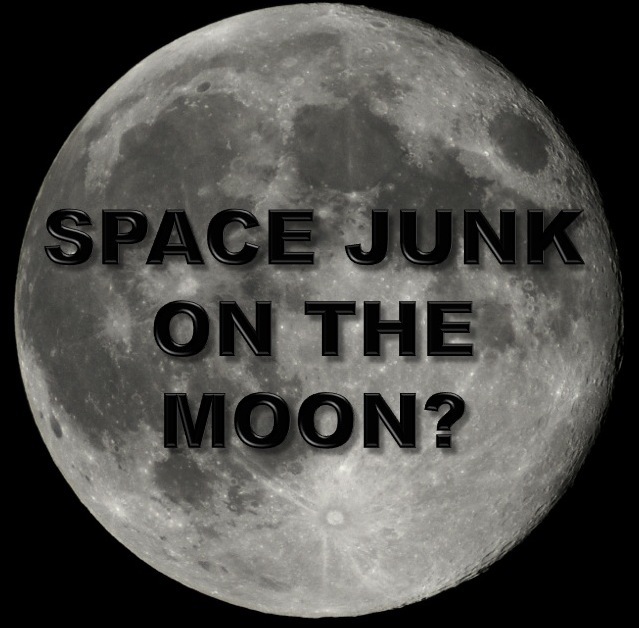 Private space company Golden Spike plans to land a person on the Moon by the year 2020. And while China is aiming for the Moon, another great Asian power, India, is aiming to put a probe in orbit around Mars this Fall. Decide in your heart of hearts what really excites and challenges you…and start your life moving in that direction. Every decision you make, from what you ear to what you do with your time tonight…turns you into who you are tomorrow and the day after that. Look at who you want to be, and start sculpting yourself into that person. You may not get exactly where you thought you’d be…but you will be doing things that suit you in a profession you believe in.